A few weeks ago, the evening news reported a truck losing control along Marcos Highway and slamming into houses along the roadside. The site of the crash was along the Quezon City-bound stretch of the road between the Marcos Highway Bridge and Bonifacio Avenue in Barangay Barangka, Marikina City. 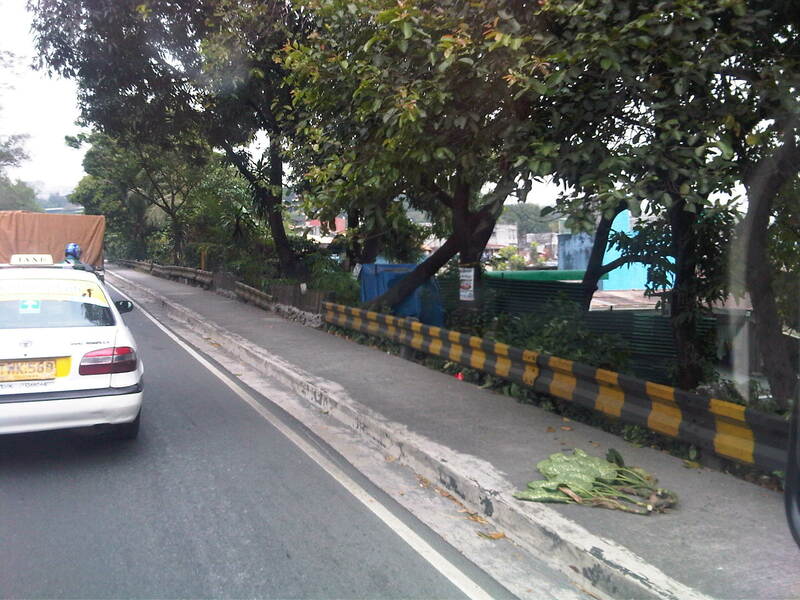 I took a couple of photos of the area when we passed by last weekend from a trip to Antipolo. The first photo shows where the truck went off the road, smashing through the barrier and hitting some houses just beside and below the road. Marcos Highway at this section is elevated because the adjacent land on the north side of the highway is a flood plain. The second photo shows a typical road side section just after the crash site, illustrating the type of barrier used that is supposed to protect residents from wayward vehicles. Clearly, the barriers were not sufficient for the purpose, which brings us to the question of what is appropriate in such cases. Fortunately, no one was killed in the crash. Traffic barriers are used to minimize the severity of potential road crashes that may occur when vehicles leave the traveled way. There are three types of longitudinal barriers: flexible, semi-rigid, and rigid. Flexible barriers are usually of the cable type and depend on their tensile strength to hold off vehicles or pedestrians. Semi-rigid barriers are usually rail and post systems such as the one shown in the previous photos. These combine tensile and flexural strength of the rail and posts to stop vehicles from getting off the road. Rigid barriers are made out of reinforced concrete and are not supposed to deflect on impact. Energy is dissipated by raising the vehicle plus the deformation of the vehicle itself. These are what are usually provided for bridges and overpasses to keep vehicles from going over in cases where there are road crashes or control of the vehicle is lost. 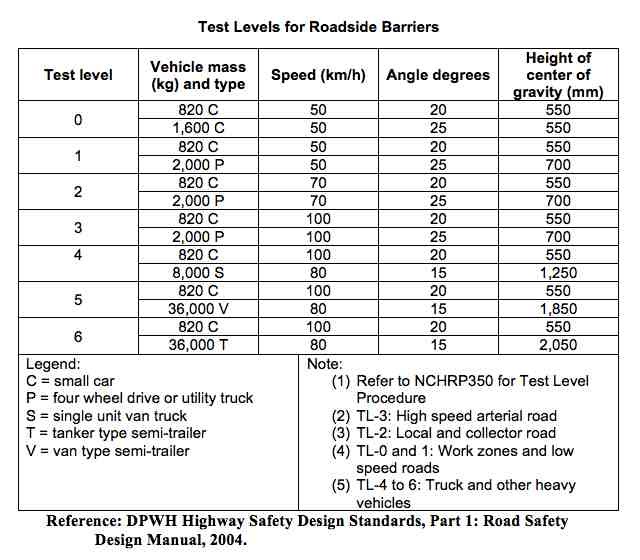 Based on the adjacent land use and the traffic characteristics along Marco Highway along with the incidence of crashes along this section, rigid barriers satisfying Test Level 4 at the very least should be constructed along the roadside. These should be designed to provide adequate protection for people residing along the road given also that vehicle speeds would naturally be reduced by the upward slope of this section. On the side of safety, perhaps Test Level 5 barriers could be provided considering observations of vehicles speeding along this section. By d0ctrine in Road Safety on February 11, 2013 .